These are some really strange critters. Although well documented, most are rarely mentioned in popular literature. The paleontologist who described the ugly Majungatholus atopus said, "It’s the kind of face that only a mother could love." The weird Masiakasaurus knopfleri had forward-facing teeth jutting out from its lower jaw; it really needed a good orthodontist. Stygimoloch spinifer sported bony spikes on its head. Tsintaosaurus spinorhinus had a horn protruding from its forehead, resulting in it being called "the Unicorn Dinosaur". 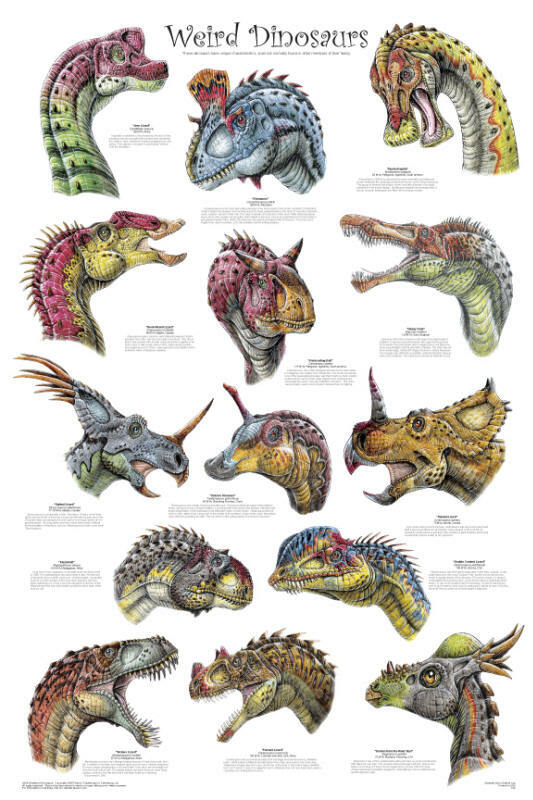 The poster shows nine more really bizarre creatures.